Are you experiencing tax problems? Confusing tax notices and long waits on hold with the IRS can make it seem like you'll never find a way to resolve them. 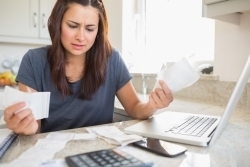 If you're in this situation, contact Michael C. Huckins, CPA, P.A.. We can file back taxes, stop wage garnishment, release liens, and deal with any other issues you're facing with the IRS. Our Boca Raton, FL CPA firm is here to help solve your tax problems promptly and get the IRS off your back. At Michael C. Huckins, CPA, P.A., a Boca Raton CPA firm, we understand that being notified that your income tax return has been selected for review by the IRS can be scary. When you are faced with an audit by the IRS you may not know where to turn or what to do. We have the skills and expertise to deal with the IRS on your behalf. We understand their rules and are experts in negotiating the lowest possible debt settlement allowed by law. If you've received an IRS notice, contact our office immediately so we can begin to work on your case as soon as possible. Ignoring problems with the IRS won't help and can even make things worse. Stop ignoring IRS notices and tackle your tax problems head-on with the sound advice and support of Michael C. Huckins, CPA, P.A.. Call us at 561-750-2272 to get started now or request a free initial consultation.